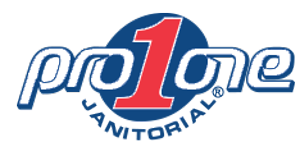 Pro One Janitorial, Inc. takes pride in servicing some of the most renowned industrial companies in the United States! Whether you need a staff of 50 janitorial experts each night or one professional to clean once per week, Pro One Janitorial, Inc. can help you by providing appropriate services. With over 29 years of experience, we have managed every job with the utmost care and concern. All our franchisees are well-trained to handle all types of cleaning tasks and use latest cleaning chemicals and processes that are focused on minimizing environmental impact. Our franchise system helps our industrial clients to maximize their building security and provides a peace of mind by possessing one of the lowest turnover percentages in the janitorial industry. When you choose Pro One Janitorial, Inc., rest assured that every job is completed on time and efficiently. Call us at (920) 309-5432 for more information. We look forward to hearing from you.